there is no reliable way to measure the real size of the US musician population. There is no agreed-upon definition for “musician”, nor certifications or qualifying tests. There is no one organization that represents all musicians. The government’s statistics excludes a huge chunk of the musician population by their own counting standards. Let’s look at each of these reasons a little more closely. First, what do we mean when we use the word “musician”? Are we just talking about performers and recording artists, or does the definition also include composers and songwriters? How about music teachers? Many musicians play multiple roles simultaneously (songwriter + recording artist + performer), but there are also creators who specialize in one role (composers who do not perform, or performers who do not compose, for example) so the parameters are important. Second, there’s an issue with how music creators define themselves. While lumping performers and composers together into a category called “musicians” is convenient for referencing this creative class, it is sometimes inaccurate. For instance, many composers and songwriters don’t identify as musicians, but as writers. Some professional singers consider themselves performers or recording artists, but not musicians. In our Artist Revenue Streams work, we wanted to hear from a broad range of music creators – composers/songwriters, musicians, recording artists, performers, session players and music teachers – because they each play an important role in the music ecosystem (and, in many instances, individual musicians are playing multiple roles simultaneously anyway). But we also wanted to respect the differences in how musicians refer to themselves, both during interviews and when constructing the survey. We tested the survey language. We used multiple terms. And, at the beginning of the survey, we explained that our use of the word “musician” was meant to include all of the roles and types mentioned above. We wanted to ensure that all music creator types knew that we welcomed their participation. If we’re using “musician” as a shorthand for this creative community, we need to be clear about who we are including in the definition. Let’s move on to the second challenge: how we decide who is actually part of this population. In 2010, when we started to draft the research protocol for the Artist Revenue Streams project, we spent a lot of time thinking about how to define our population of study, a necessary step in any research project. For many populations, there are commonly-understood criteria, or demographic characteristics, or certifications that make this sorting process relatively easy. But unlike – say – doctors or lawyers, there are no formal exams for musicians to pass, nor accrediting organizations to join. There is nothing stopping a young guitar player from declaring herself as a “musician”, packing up the van and hitting the road, nor is there any formal accreditation needed for an eager wordsmith to hang out his shingle as a “songwriter”. Indeed, some of the nation’s most successful performers and songwriters have been self-taught or motivated purely by desire and raw talent, unconstrained by “rules” about who qualifies to participate in the music creator community. Then there’s an additional challenge; determining who should be considered a “professional” musician. There are hundreds of thousands of people in this country who enjoy writing songs, playing music, releasing recordings or uploading a video once in a while. But when doing research on the earning capacity of the musician population, it’s important to devise a way to identify those who are making a living from music. The question is, should it be based on workweek hours, career lifespan, music degrees, a certain number of recording or composing credits, education, income, label affiliation, union membership, or a combination of these things? With no agreed-upon criteria about who should be included, it’s difficult to determine the size of a population. We thought about this a lot when designing Artist Revenue Streams, and below we describe a few options we considered. Given the challenges with definitions noted above, perhaps the best proxy for population size could be based on organizational affiliation. Many composers and songwriters belong to one of three performance rights organizations – ASCAP, BMI or SESAC. Many performers and recording artists belong to one or both of the key music unions – AFM or AFTRA. Then there are the professional organizations like the Recording Academy, role-based groups like Songwriters Guild of America or the American Composers Forum, and genre-related groups like the Americana Music Association, Folk Alliance, or the Gospel Music Association. Perhaps if we tallied up all of these memberships, we could get a sense of the size of the US musician population. SESAC: membership numbers are not published. Songwriters and composers almost always pick one of these three exclusively, so the possible total with even basic math is over 900,000. But, each PRO represents more than just individual composers – their memberships also include music publishers. Some members are both composer and publisher (self-published, in other words), while some composers are represented by an existing publisher. And there’s one more twist; compositions have a long copyright life, so the PRO membership rosters include estates of deceased composers. Their compositions are still active and making money through licensing, but the creators are no longer part of this world. It would take some additional work with each PRO to get a better estimate of the composer/songwriter members. Challenge 2: organizational affiliation is not universal, even in instances where the organization is a source of income. While conducting our interviews and survey, we asked specific questions about PRO, union, and association membership. About 80% of survey respondents belonged to at least one organization or a PRO, but we also found exceptions at every turn: high-level composers who were not members of a PRO; full time freelancers/session players/sideman who were not AFM members; hard touring rock bands whose members were not part of the Recording Academy or a union. And so on. For instance, 16% of the survey respondents who belonged to one of the key composer or songwriter organizations in the US were not members of ASCAP, BMI, SESAC or a foreign PRO. Organizational affiliation can be a helpful measurement, but there will always be exceptions. Organizational affiliation can give us a rough sense of the population size(s), but limited access to membership information, the difficulty in estimating organizational overlap, and non-universal enrollment each weaken the value of this strategy as a proxy for population size. If organizational affiliation is too vague, then perhaps the best source for these numbers is the US government. There are two typical sources for this type of data: the US Census and the Bureau of Labor Statistics. The Bureau of Labor Statistics’ Occupational Employment Statistics (OES) is more commonly referenced for employment data, and publishes updates every year. 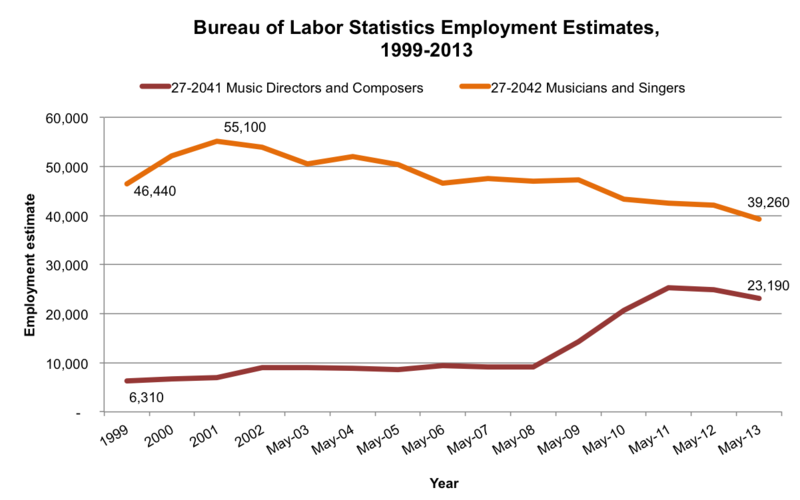 According to the BLS May 2011 report, there were 25,290 music directors and composers and 42,530 musicians and singers in the US. These numbers also seem low, especially when compared to the ballpark number of composers listed above, or to the number of AFM and AFTRA recording artist members in the US, which is over 90,000. Why the enormous discrepancy? It might be because BLS OES data – by definition – does not include self-employed workers (see footnote 1 on any recent report), which we know many musicians and composers are. Indeed, outside of salaried player work or faculty teaching positions, almost all musicians and composers are self-employed. The US Census and publishes updates every five years. The NAICS category 711510 refers to “Independent Writers, Artists and Performers” and includes “independent (i.e., freelance) individuals primarily engaged in performing in artistic productions, in creating artistic and cultural works or productions, or in providing technical expertise necessary for these productions.” The 2007 data (latest available) indicates that 48,321 individuals were employed in this category. 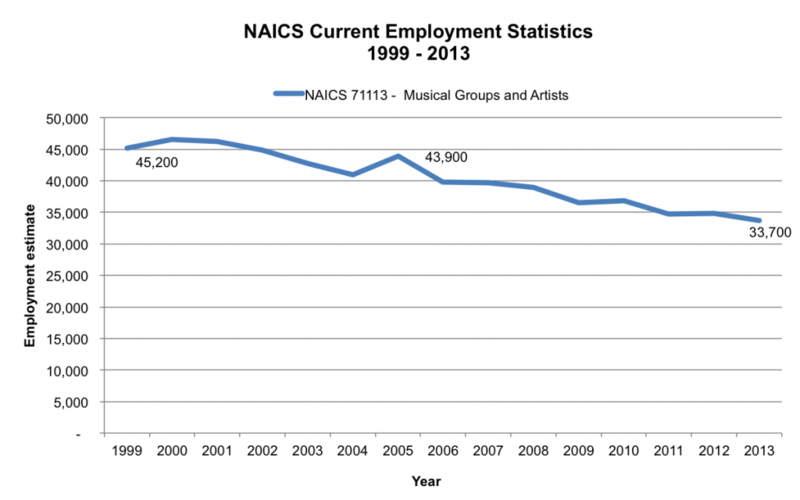 Musicians may also be found in NAICS 711130 “Musical Groups and Artists”, which indicates that 41,033 individuals were employed in this category in 2007. Taken together, this tallies up to about 90,000 individuals, a number that’s much smaller than even the most conservative take on organizational membership. Government statistics have some value because they are reliably collected over time. This chart shows the trendline for the broad NAICS industry category of 71113 “Musical Groups and Artists”. Note that this chart has been updated each year as NAICS publishes new data. The chart below shows BLS employment estimates for two more specific categories: music directors and composers (red line) and musicians and singers (orange line) over the past fourteen years. Note that this chart has been updated each year as BLS publishes new data. It’s valuable to have some trend data, but the chart above also generates more questions. Why the unexplained jump in music directors and composers around 2008? This could be explained by: (a) the tiny sample sizes that the BLS uses to extrapolate these kinds of counts for the whole population, which makes the estimates of the number of people in just one particular profession somewhat volatile; (b) some kind of change in methodology — the fact that BLS is reporting a three-year moving average suggests a huge jump from the 2008 number to the 2009 number; (c) some combination of the two; or (d) something else. As with the other strategies, examining government data can give you a sense of the size and changes over time, but the fact that BLS OES data does not included self-employed musicians makes it likely that the published number is far lower than reality. Nielsen SoundScan and Nielsen BDS collect and publish very detailed data about music sales and airplay. Nielsen reported that, in 2011, there were 76,875 albums that sold at least one copy. Of course, we’re talking about albums here – not musicians – and Nielsen’s numbers do not account for the recording artists’ citizenship or place of residence. Then there’s Pollstar, the touring industry’s mega-directory that includes management and booking agent rosters. The Pollstar website currently lists over 14,000 acts. These is a helpful indicator of the number of active touring bands and artists, but it would take a significant manual labor to account for the number of musician members in each band in the directory. Then there are the music aggregators and data sites. CD Baby’s website says its store includes the music of over 300,000 artists. There are many thousands of artists using TuneCore (client numbers not published). Next Big Sound’s website says its database includes 700,000 artists. But the bigger issue with using these sites as a measurement of the musician population is that they tend to leave out: (1) the composers and songwriters who do not play live or tour; (2) salaried orchestra players who have no need for a booking agent, manager or aggregator; and (3) session players and freelancers. All Music Guide’s site includes an enormous amount of information about artists and composers – present and past – but it would take some significant sifting to isolate currently active, US-based musicians. Commercial directories and databases can be helpful in measuring certain aspects of the music ecosystem, but none is designed to count musicians. As with the other data sources, they help us understand the approximate size, but are insufficient serving as a reliable population number. When we were building out the protocol for the Artist Revenue Streams project, we confronted and wrestled with each of these problems. What are the minimum qualifications to be considered a “musician”? Should it be based on hours worked, income, recording or composing credits, memberships, professional training, label affiliations? In the end, we decided that our survey would only be limited by two criteria: (1) survey takers needed to be US citizens or residents, and (2) they needed to be 18 years of age or older. Those who did not meet both of those criteria exited the survey after the second question. The remainder of the survey asked questions that helped us to build specific population strata. For instance, survey takers who spent 36 or more hours a week doing music and earned 90% or more of their personal income from music were grouped together as “full time musicians”, and we were able to look at the revenue changes of this particular population. Those who self-defined as composers, had more than 20 composing credits, spent more than 36 hours a week doing music, and earned more than 90% of their income from music were categorized as “composer specialists”. We were also able to filter the survey data by role, by primary genre, by workweek hours, by estimated music income, label relationship, “teammates”, education, race, gender, and PRO or union membership. Instead of imposing a definition of “musician” on the front end of the survey and filtering out musicians who did not meet our predetermined criteria, we collected data from anyone who self-identified as a musician or composer, and then examined the data through various filters and applied criteria in the analysis phase. So, how many musicians are there in the US? Even after months of work, we do not know the true size of this population beyond rough estimates because of the very issues outlined in this article. We suspect that it will always be difficult to know the actual size of this dynamic population. What Artist Revenue Streams does provide is a data-driven snapshot of the income streams on which musicians and composers are relying presently, and how they are changing over time, examined in detail through various filters and lenses to get a better sense of what it’s like to be a music creator in the 21st century.